Honour the noble houses of Westeros, and warn others of the coming winter with the official Game of Thrones 3D Mask & Wall Mount series. Using Wintercroft's fantastic 3D poly-style mask designs, take these iconic house sigils and create easy-to-make masks to either wear, or mount on your wall as trophies. They say a Lannister always pays their debts - show you do the same with this fantastic mount, perfect for any Game of Thrones fan's home. 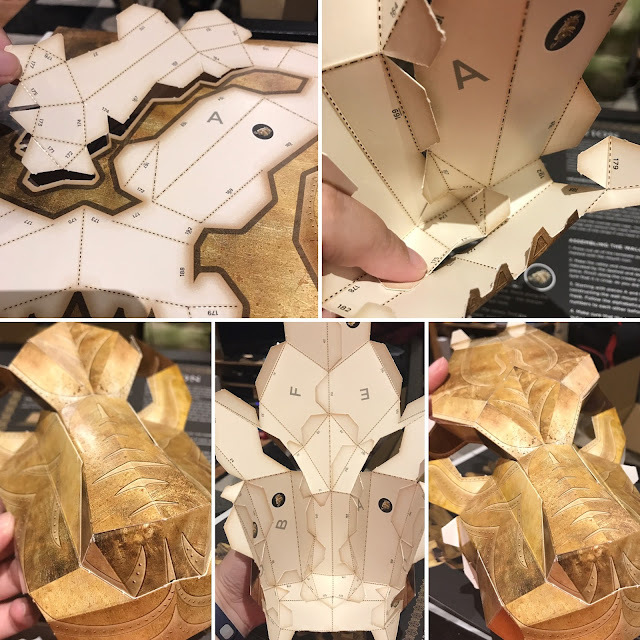 I have to admit I've never made anything like this before but I love trying out different crafty projects so as soon as I saw these Game of Thrones masks I wanted to try them. 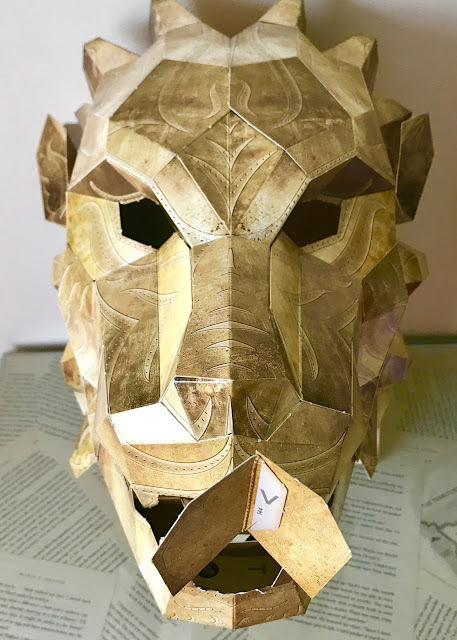 This book includes all the pieces you'll need to make a Lannister Lion Mask as well as a wall mount that the mask will sit on when not in use (so it'll look like you have a lion's head hanging on your wall!). The only things you'll need to make the mask is glue (I used a pritt-stick) or double sided celotape and for the wall mount you'll also need a pair of scissors. 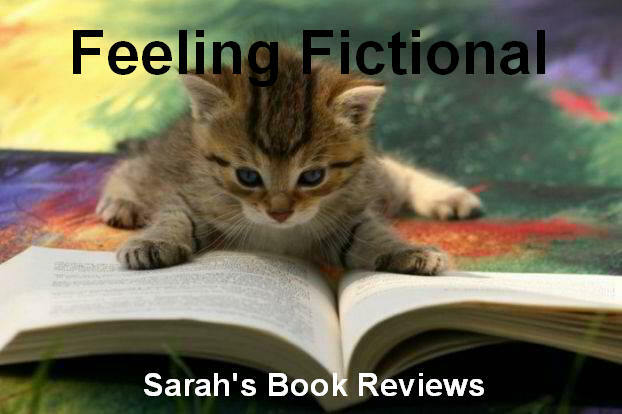 The book comes with very clear instructions that you should read carefully before getting started. It recommends starting by making the mast and the first thing you'll need to do is carefully pop out the 26 pieces needed to make it. The pieces are marked A to Z and you use them in alphabetical order (be careful because the lettering is the same for the pieces to make the wall mount but they have different symbols on them so you need to make sure you have the right pieces!). Start with piece A and make all of the required folds (there are instructions in the book to help you know what types of folds are needed - valley or mountain). Then you'll see lots of small numbers on the inside of the piece and you basically need to join the matching numbers together using the tabs on one side. The best thing to do is to hold the piece in shape until you know exactly how it's supposed to fit together, this can be a little fiddly but once you have it figured out gluing it in place is very straightforward. 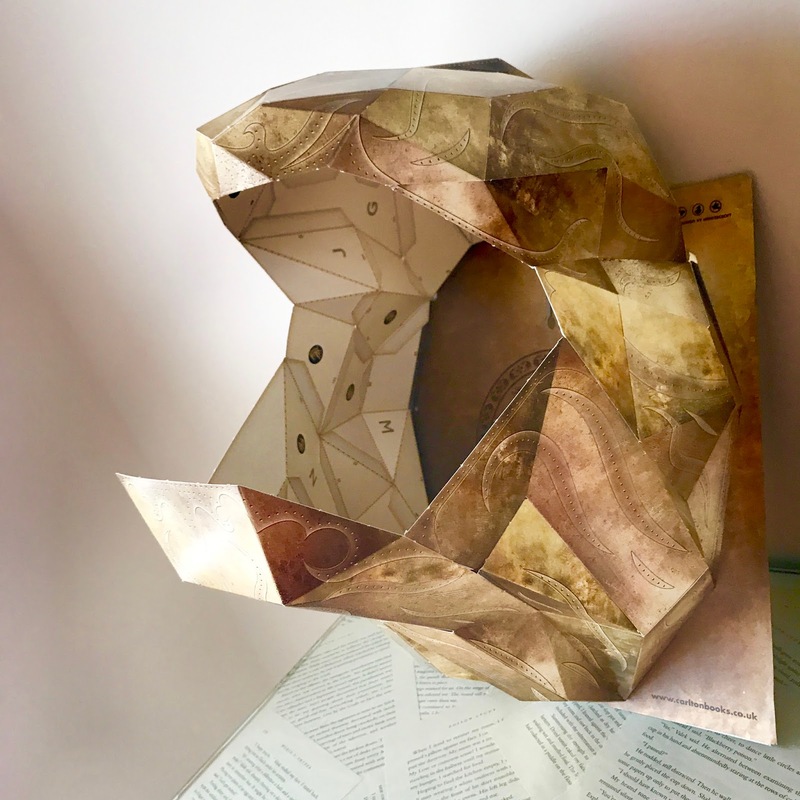 Once you've connected all the parts from piece A you can fold part B and glue them together, gradually add each letter until the mask is complete. It takes time to complete the project, especially if you've not done anything like this before, but I managed it easily on my own so as long as you're careful you shouldn't have any problems. The important thing is to make sure all the tabs are fully glued in place before you move on to adding the next piece or you'll end up finding it starts to fall apart later (I'm talking from experience there!). The completed mask looks absolutely incredible and I'm thrilled with it. There is a strap that has to be adjusted to your personal requirement so the mask will only fit one person but once you have it lined up it's really comfortable to wear and would look great for Halloween or a fancy dress party. The second part of the project is making the wall mount for the mask to stand on and I have to admit I found that part more fiddly than making the actual mask! It has slightly less pieces (I think it was 18 rather than 26) but they fit together to form a ring and I found it awkward trying to attach both sides together at the end but again with a bit of patience I was able to do it without any help. Once you've connected the pieces you have to attach them to the baseboard (included at the back of the book) and again I found it hard to get the ring into the exact shape I wanted. In the end I found the easiest option was to hold the mount in place using bulldog clips and then once I had the whole thing where it needed to be I was able to tape it in place. The wall mount on its own doesn't look particularly impressive but by the time you add on the mask it makes a brilliant piece of wall art! I had so much fun making this and I love the results so I definitely think I need to collect the rest of the set. 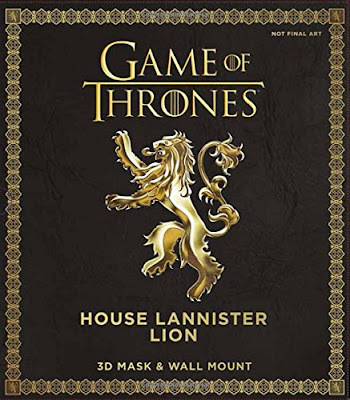 The Game of Thrones official 3D mask and wall mount books, published by Carlton Books, will be available at all leading book retailers and www.carltonbooks.co.uk at a price of £14.99. The Stark Direwolf and Lannister Lion books will be available from 10th August, with the Targaryen Dragon and White Walker books will be available from 7th September.